The ADTS 505 is the newest in a series of dependable, compact and accurate Air Data Test Sets. This flight line design of the unit has been developed from continuous research and development. The unit results in acquiring high performance, ease of maintenance, and operational simplicity to be optimized. In an attempt to enhance the number of available flight paths, Reduced Vertical Separation Minima (RVSM) regulations were developed. The purpose of RVSM is to safely lessen the allowable separation between airborne aircraft from the present 2000 feet to 1000 feet (between altitudes of 29,000 feet and 41,000 feet). 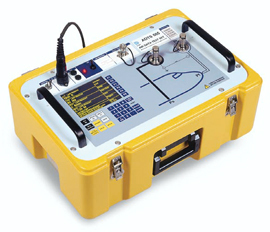 A compact portable Air Data Test Set ideal for civil aircraft applications. The ADTS 505 Remote Hand Terminal considerably improves operation of the Druck ADTS 505 Air Data Test Set. Purposely intended for use with civil aircraft, it utilizes the similar front panel display and keypad interface. While seated in the aircraft cockpit, the remote hand terminal employ sophisticated test routines. This results in reduced possibility of communication errors and aircraft testing time.